The marquee sign outside Luna City High School makes note of the fact that the school is home to the Mighty Fighting Moth Football Team – District Champions – 1967 – 1971 – 1974. That there is only a small space left to insert another champion year or two is clear indication that the Mighty Fighting Moths football coach, school administrators and team boosters have completed their journey through denial, anger, bargaining, depression, and accepted the sure and certain knowledge that there will likely never be another district championship in their future with quiet fortitude. It’s not that the Moths lack heart and determination; players and boosters alike begin each football season in the spirit of game optimism, and in the hope that maybe this year the Karnesville Knights or the Falls City Beavers – which are the two regional football powerhouses and die-hard rivals – will not be able to defeat them 80+ to 6 with the casual absentmindedness of a man swatting a fly while thinking of something important. Texans live for high school football; it is simply the expected thing to do, and Luna-ites are heart and soul Texans, even those who came from somewhere else, like the Walcotts or the Steins, or Chris who bartends and manages the Ice House, Gas & Grocery. It is simply the Done Thing – although why the Moths have not had a purely winning season in four decades is a matter of passionate discussion at the Café & Coffee, the Icehouse and regular BBQ picnics at the VFW. The usual conclusion is that this is due to the relative shallowness of the bench, as Luna City High School is a relatively small one. However, Dr. Stephen Wyler suspects dark machinations on the part of realtors in Falls City and Karnesville. He is convinced they have carried on a forty-year plot to offer absurdly good deals on residential real estate to families of sturdy youths with good athletic prospects in an organized effort to maintain a large pool of players. Most Moth boosters dismiss that theory, as well as criticism of the Moth’s current coach, Dwight Douglas “Music Man” Garrett, for he has only been coaching for the past decade. His immediate predecessors were renowned coaches of football in the old-school style, and one of them had overseen the Fighting Moth’s last winning streak. Otherwise, it is as much a mystery as the wholly unexplained random disasters which strike the Moth’s homecoming games with disturbing frequency, ensuring that liability insurance for participants and spectators is always paid up. The Mighty Moth Homecoming game is most usually held in conjunction with Founder’s Day – a local celebration marked by a parade through Luna City led by the Mighty Moth Marching Band, a carnival set up in Town Square, and numerous other events, culminating in a football game on the Luna High School home field. It is a matter of historical record, however, that every few years, the game is disrupted, delayed, or even cancelled entirely due to an unforeseen accident. Sometimes this is due to human agency or a suspected misfiring prank, and sometimes to what can only be described as a freak of nature, such as in 1988 when Hurricane Gilbert roared through Texas, and a small tornado touched down on the Luna High playing field shortly before game time. Four years previously, excessive flooding from another tropical storm produced the interesting phenomena of a plague of frogs invading the field. During one Homecoming game (the year is a matter for intense disagreement) excessive leaking from a cracked water main dissolved a layer of limestone underlying the end zone, resulting in a substantial sinkhole opening up in the guest-team end zone – fortunately during half-time. The only near-casualty was the Falls City Beavers mascot, who happened to be standing in the end-zone, but he was pulled clear by quick-thinking bystanders who managed to catch ahold of his costume tail. In the mid-1990s, the Beavers mascot was a casualty of yet another Moth Homecoming incident; attacked by a live beaver, which inexplicably appeared just before the game. A human prankster was suspected; since then, Falls City has been reluctant to participate in Moths Homecoming games. Human agency was involved in the stampede of nilgai antelope from the Lazy W Ranch, which broke up the 2000 Homecoming game. A section of high-fenced game pasture abutted on a paved service road near the high school. A quartet of poachers, taking advantage of Founders’ Day festivities appeared with a stock-hauling trailer, and having lured a dozen nilgai close to the fence, cut the fence and attempted to load them into the trailer. The nilgai were not cooperative, and galloped away in a body … straight across Moth Field. The most recent Homecoming game disruption was also in the form of an escaped large animal: one of the Wyler’s breeding bulls, who upon escaping from durance vile, inexplicably became enamored of one of the marching band’s tubas. The tuba player, understandably traumatized by the experience, immediately gave up marching band and switched over to playing the piano. Which brings me to the Mighty Fighting Moth Marching band; the redeeming bright spot in Luna City’s sports program. Under the direction of Coach “Music Man” Garrett, they have swept band competitions from Laredo to Richmond, to Amarillo and Texarkana for the last ten years, with a combination of razzle-dazzle formations and mind-blowing musical selections. Their marching-band rendition of Orff’s O Fortuna is a show-stopper, although at least half the student body is convinced that the number is really called Gopher Tuna. Moth boosters comfort themselves over yet another double-digit to single-figure stomping on the football field by contemplating the case full of glorious band competition trophies on display in a glass case in the main foyer of the high school. And of those graduating Luna City students to go on to college? A good number of them go on band and music scholarships. The PTA and Booster Club, though, keep a particularly thick cushion of funds, on hand, in expectation of the next Moth Homecoming disaster. As the last one was three years ago, the time is more than ripe for the next. The little town of Luna City is not a city at all, as most people understand these things. 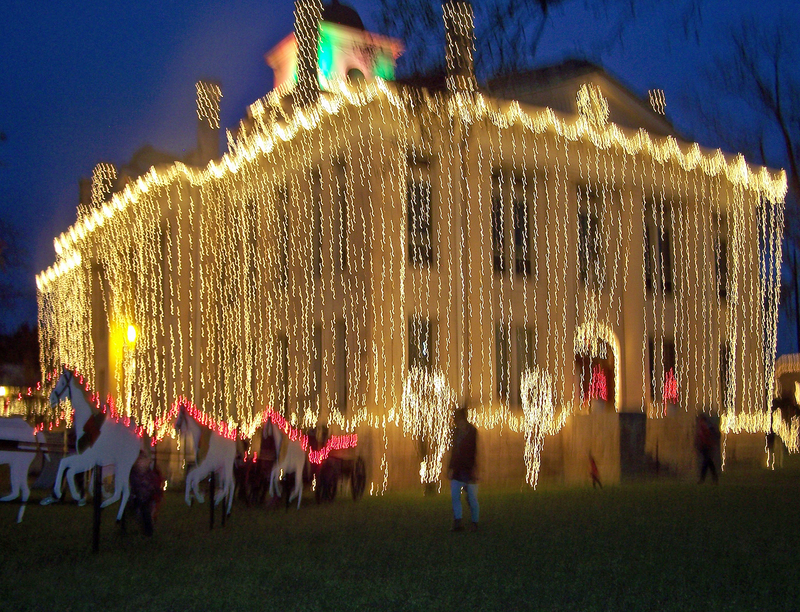 It is a small Texas town grown from a single stone house built by an immigrant Bohemian stone-mason in 1857, at a place where an old road between San Antonio, Beeville and points south forded a shallow stretch of river. 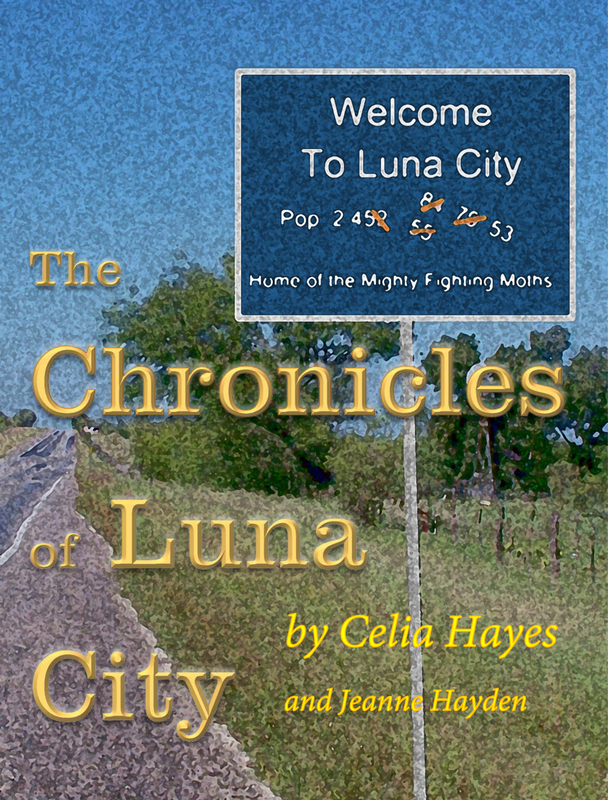 The railway was supposed to come through where Luna City would be – and the city fathers confidently expected it to become the county seat. Alas, when Dr. Stephen Wyler’s great-aunt Bessie eloped with a smooth-talking engineer on the Galveston, Harrisburg and San Antonio Railway, her father – who owned much of the land in the district – was furious. The railway, he stormed, was an invitation to vice and debauchery of every kind, a threat to the virtue of young women and girls – and so he saw that it never came to Luna City; although there had been a generous space allotted in early plans of Luna City for the usual magnificent Beaux Arts-style county courthouse in the square at the center of town. That expectation also came to naught; the county seat stayed in Karnesville, and since then, Luna City has made very little effort to attract the casual tourist. Sefton and Judy arrived sometime in the summer of 1968 in a colorful cavalcade of carefree spirits intending to establish a communal farm; forty-five years later, they are the only members of it who remain. 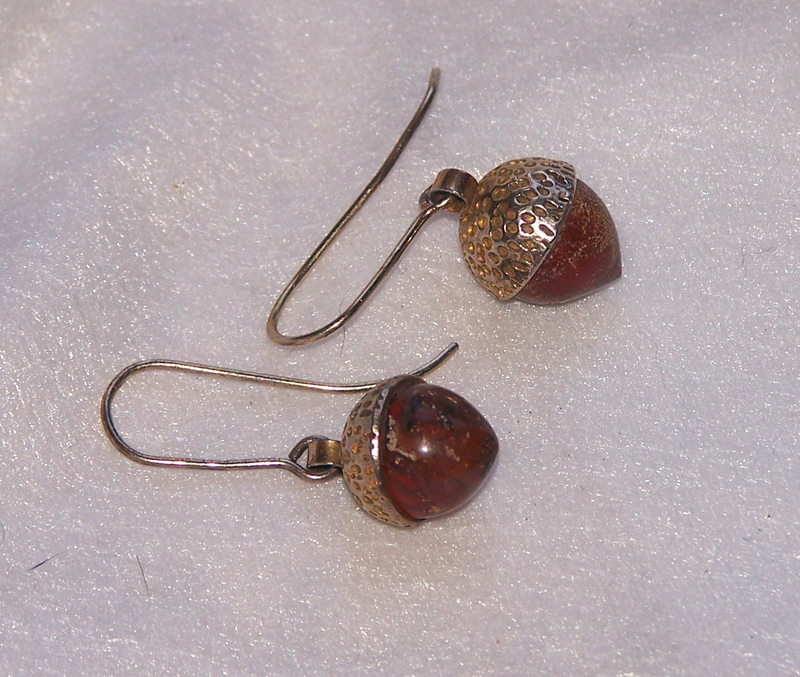 Odd as it may seem at first or even second glance, they are valued members of the community. 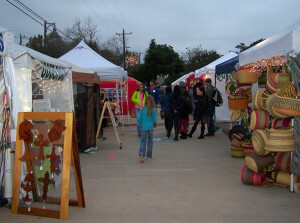 They set up in Town Square every Saturday morning, under the biggest of the oak trees, and sell fresh vegetables – which are sometimes a slow-seller, because in Luna City, most residents have a vegetable garden themselves – but also eggs, honey, home-made goat-milk cheeses, herbs, and hand-made soap. The Grant’s vegetable patch has the advantage of deep and rich soil on the bank of the river, and generous applications of well-cured compost seasoned with goat-manure. A single disintegrating Airstream trailer is still parked there in the field which is supposed to be the campground, a relic of the past. Sometimes a relatively broke or undiscriminating traveler rents it for a couple of days or weeks; the Englishman who manages the Luna City Café and Coffee lived there for six months. Only a few residents of Luna City refer scornfully to the Grant place as Hippie Hollow. Mrs. Sook Walcott is one of these; if Jess Abernathy has commerce in her bones and blood, Sook Walcott has all that, tempered with the acid of pure acquisitive capitalism. The Grants are liked, and Sook Walcott is not … more about that, later. The tea room and thrift shop housed in the front room of the old McAllister house is open only two days a week, which discourages casual visitors, but not anyone who knows Miss Leticia McAllister; the last woman in this part of the world who always wears a hat and gloves when she leaves the house, not just for early Sunday services at the Episcopal church. The formidable Leticia McAllister – always known as Miss Letty, even during those decades when she taught first grade in the Luna City Elementary school – is notoriously impatient, especially of anything reputed to be humorous. 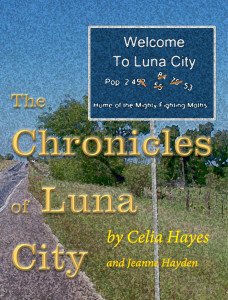 On the occasion of the centenary of Luna City, Miss Letty and her older brother, Doctor Douglas McAllister (the doctorate was in history, which he taught at a private university in San Antonio) compiled a commemorative volume of local history, gleaned from the memories of the oldest residents; scandals, shenanigans both political and sexual, the last gunfight in Luna City (which happened in front of the Luna Café and Coffee) old feuds and new, controversies over every imaginable small-town issue – it’s all there in A Brief History of Luna City, Texas, published privately in San Antonio, 1976, price $18.25 plus sales tax. The Luna Café & Coffee still has a small and dusty stack of them behind the cash register counter – although the manager/chef at the Luna Café & Coffee has no idea of what they are or what to do with them. Where he comes from, a hundred years is practically yesterday. Miss Letty’s erratically-open tea room also has a couple of boxes in inventory. Dr. McAllister, whose puckish sense of humor was not appreciated by his sister, was dissuaded from titling it A Hundred Years of Lunacy in South Texas on the very fair grounds that other places possessed a history every bit as scandalous, and that it would somehow encourage local residents to be called Lunatics, rather than Luna-ites … and that simply would not do at all. Luna City, you will gather from this short introduction, does not discourage visitors, exactly; but neither does it welcome them effusively. Luna-ites prefer to take a quiet measure of such visitors who do venture into the heart of downtown, and treat them with exquisite Texas courtesy. Those who choose to remain longer than a quiet stroll around the square or stop for a lunch at the Luna Café & Coffee – never doubt their welcome. And if they fall under the spell, and stay , within four or five years, they are as established and respected as any of the original Luna-ite families … McAllisters, Gonzalez-with-a-z and Gonzales-with-an-s, Abernathy-who runs-the-hardware-store, Wyler-of-the-Lazy-W-Ranch, the Bodies of the feed mill and all the rest. Luna-ites have no urge or need to distain relative newcomers. They know exactly who they are, and do not need proving it to anyone.